What Else can I Expect From an Online Associate in Theology Program? 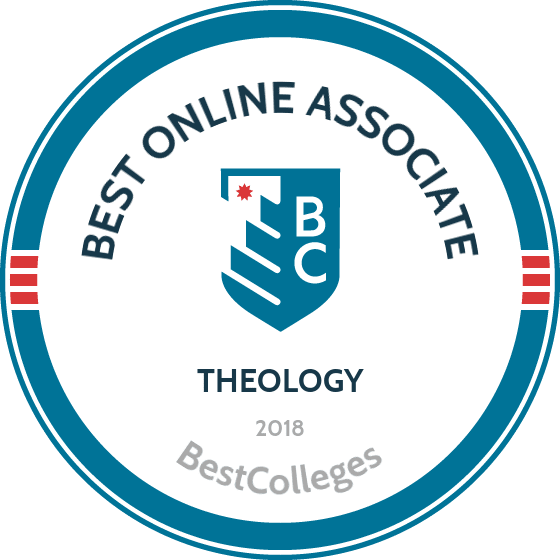 WHAT ARE THE BEST ASSOCIATE IN THEOLOGY PROGRAMS? What Can I Do With an Associate in Theology Degree? Theology is a broad field that examines the foundations, tenets, and practice of religious beliefs. Students study historical religious texts, scientific evidence of divine existence, and testimonials of spiritual experiences. Theology provides students with the academic background to advocate and preach for a particular religious tradition or to challenge them. Theology can also be a way to examine religious beliefs without reference to any formal religious tradition. If you enjoy debating religious topics and find yourself curious about the nature of divine and spiritual phenomena, an associate degree in theology may be right for you. $10,000 to $20,000 is the average cost for a year's tuitio. The Association of Theological School. Established in 1943 for students called to pastoral ministry, The Baptist College of Florida in Graceville offers students an opportunity to study in a Southern Baptist environment. The school has an online associate degree in theology with in-state tuition rates for distance learners. Students enrolled in this program must complete 66 credits of coursework, including 21 general education credits and 39 credits related to biblical/theological studies. Coursework is available completely online and is taught asynchronously. Applicants are required to submit a statement of faith and a recommendation from a local Christian church that shows active participation for at least one year. The program provides introductory general education coursework in the context of a biblical worldview and focuses on basic training for ministry, including Bible knowledge, theology, and pastoral skills. Coursework for this associate degree includes classes in biblical hermeneutics, evangelism, pastoral leadership, and preparing expository sermons. The program concludes with a preaching practicum. Founded in the city of Circleville in 1948, Ohio Christian University provides a holistic Christian education in the Wesleyan tradition that focuses on preparing students to serve as clergy members. The school offers an online associate degree in theology that emphasizes foundational knowledge of the Old and New Testaments. The associate of arts in Christian ministry requires completion of 60 credits, including a 12-credit concentration in either biblical studies or pastoral ministry. 48 credits of core classes include Bible study methods, evangelism, and theology of the Christian experience. The biblical studies concentration offers courses in the Pauline epistles, life in New Testament times, and the Pentateuch. All classes are taught asynchronously. The school offers a military tuition discount, and students can petition for transfer credits. OCU focuses on understanding God's word and integrating Christian principles into critical thinking and decision making. Located in Fayetteville, North Carolina and founded in 2000, Grace College of Divinity provides biblical training, personal development, and preparation for practical ministry within a formal, traditional Christian environment. The school's two-year associate degree in theology is well-suited for students seeking to assume service and leadership roles at local churches. This program caters to the needs of nontraditional students who work full-time. GCD’s associate of divinity degree is offered with three areas of emphasis: biblical studies, theology, and practical ministry. Students must complete a total of 60 credits, including six credits of elective coursework. Required classes include hermeneutics, destiny and calling, systematic theology, world missions, and church history. Students must also fulfill a “leadership in action” requirement. Applicants should submit a two-page essay about their Christian conversion experience and a pastoral letter of reference. Up to 60 transfer credits may be accepted. The school also encourages students to contribute to its contemporary theological journal. Established in Lake Wales, Florida in 1968 by Church of God pastors and laity, Warner University offers an associate degree in theology that is tailored toward the needs of students who are already serving in full-time ministry roles but would like to complete their degree. The associate of science in church ministry is offered completely online. Most students are enrolled full-time and complete two courses every eight weeks, although part-time enrollment is allowed. An accelerated degree-completion program is also available. Financial assistance and tuition scholarships are available, including grants for Florida residents. Applicants must be nontraditional students who have a minimum GPA of 2.0 and are at least 23 years old or have significant life experiences that demonstrate their maturity and discipline. The school has a generous transfer policy and offers ways to earn credits through experiential learning. Located in Winston-Salem, North Carolina, Piedmont International University provides affordable, Bible-centered higher education to prepare students for Christian ministry. The school offers one of the best online theology degrees in the country. Full-time students complete their studies in two years, while distance learners who enroll part-time typically finish in four years. This associate program is designed to prepare students to transfer into four-year programs, offering the equivalent of a semester of general education. It also concentrates on integrating a biblical worldview into professional and personal life. The online associate of arts in Bible studies requires the completion of 64 credits, including seven credits of ministry and six credits of electives. Courses are offered in seven-week sessions. The curriculum includes classes in Christian ethics, evangelism, eschatology, and the life of Christ. In addition to asynchronous lectures and discussions, online students can join lectures in real-time and participate in homework sessions with professors. Distance coursework is accessible through the Blackboard learning managements system. Founded in 1900 in the conservative Wesleyan-Arminian tradition, God's Bible School and College in Cincinnati, OH is one of the oldest and most affordable Bible colleges in the United States. The school offers two online theology degree programs. Its associate of arts in Bible and theology requires students to take 60 credits and provides a strong biblical foundation. The curriculum includes classes in church history, ministerial education, the doctrine of holiness, and wisdom literature. Alternatively, its associate of applied science in ministerial education program is best-suited for students who are unsure about their calling to preach and are seeking educational guidance. This program consists of 68 credits, including a nine-hour sequence in preaching, and prepares distance learners to pursue a bachelor's degree in ministerial education. Sample coursework includes discipleship in small groups, evangelism, and principles of Christian life. A 20% tuition discount is available for students whose parents are involved in full-time Christian service. Located in Colorado Springs, Colorado, Nazarene Bible College was the first Nazarene college to offer a higher education degree online. The school specializes in teaching adult learners how to evangelize and minister to the world. The associate of arts in ministry prepares students to conduct service work in churches or Christian organizations. NBC offers concentrations in Christian educational ministries, church ministries, early education, and Hispanic pastoral ministries. Distance learners must complete 64 credit hours with a minimum GPA of 2.0, including 28 general education hours, nine Bible and theology core hours, and 27 concentration-related hours. Because NBC receives financial support from the Church of the Nazarene, it is able to offer students relatively low tuition costs and institutionally-funded scholarships. Distance learners interested in completing ordination requirements in the Church of the Nazarene can do so by completing 11 additional courses. Established in Kirkland, WA in 1934, Northwest University is a Christian school affiliated with the Assemblies of God. The school offers an accredited online theology degree in the form of an associate in ministry leadership. This 60-credit program is delivered fully online in a cohort model learning community. Classes are delivered asynchronously. The curriculum includes courses in the Pentateuch, Israelite conquest and monarchy, the Book of Acts, and the Synoptic Gospels. Graduates receive the training they need to work in the field of ministerial services. Interested students are also prepared to enter NU’s bachelor’s of arts in ministry leadership program. Applicants are assigned a personal admissions representative who guides them through the application process. A minimum GPA of 2.0 is required for conditional admission, while a GPA of 2.3 is needed for regular admission. Established in 1997 and located in Southlake, Texas, The King’s University is an evangelical institution dedicated to preparing students for ministry in the Pentecostal/Charismatic tradition. The school has additional campuses in three other states and also offers programs online. One such program is TKU’s affordable two-year associate of Christian ministries theology degree, which can be completed asynchronously through the Blackboard learning platform. Classes are taught in seven-week sessions. Distance learners must complete 62 credits, including 15 major-related credits and six credits of electives. Students pursuing this theology degree online gain fundamental knowledge of scripture; understanding of Christian tradition, practices, and doctrines from a Pentecostal perspective; and growth and development in spiritual discipline. The curriculum features courses in Pentecostal Charismatic movements, biblical counseling, and healthy family dynamics. In addition to their academic background, prospective students are assessed based on their moral behavior and character, spiritual journey and goals, and appreciation of TKU's mission. Founded in 1974 in Sacramento, California, Epic Bible College teaches students the practical skills needed for Christian ministry. EPC features a diverse student body, small class sizes, and professors who are active in ministry. Applicants must submit a statement of concurrence and express a personal experience of conversion to Christianity. EPC offers two affordable, fully-online associate degree paths. Its associate of arts in Christian studies track requires the completion of 95 quarter credits, including 64 general education credits, 23 core credits, and eight elective credits in Bible and ministry studies. Students learn essential doctrine, apologetics, and biblical interpretation. Alternatively, its associate of arts in ministerial studies with an emphasis in biblical studies includes courses that discuss the history of Christianity, principles of prophecy, and developing a biblical worldview. Several other concentrations are offered at both the associate and bachelor's level, including biblical counseling, cross-cultural ministry, nonprofit management, discipleship, pastoral leadership, and worship arts. Clergy are religious leaders who usually preside over religious rituals or oversee religious activities and education. The various roles and names for clergy members vary depending on the specific religious tradition and denomination. Christian religious leaders include pastors, ministers, priests, and bishops. Jewish religious leaders are called rabbi. Clergy members are typically ordained by a specific religious institution, like a Church or Mosque, and work with that institution to teach religious doctrines and practices. High school teachers are responsible for educating students and preparing them for college or the job market. They create lesson plans according to the school district's curriculum and objectives, give lectures, and facilitate preparations for standardized tests. High school teachers must have a bachelor's degree and be licensed by the state to teach certain subjects. An associate degree in theology could be beneficial for those who wish to teach at a religious private school. Social and community service managers oversee the day-to-day operations of community service organizations, nonprofit organizations, social service companies, and government agencies. They manage volunteers and paid service workers who provide social service programs. This position typically requires a bachelor's degree and some work experience. Social workers dedicate their lives to helping individuals, families, and communities with everyday problems. Social workers work in a variety of settings, including hospitals, adoption clinics, non-profit organizations, social service organizations, and mental health institutions. They are often required to have a bachelor's degree in social work. Clinical social workers must also have a master's degree and be licensed by the state in which they work. A theologian is a specialist who teaches theology courses and gives lectures. Many theologians are also university professors who conduct research regarding the nature of the divine, publish academic papers, and teach college level courses. Theology professors are required to have a PhD in theology or a similar field. After obtaining an associate degree in theology, you may want to consider transferring into a bachelor's program. An undergraduate program gives students the opportunity to focus their education, like on Biblical texts. Some professions require a higher degree. Teaching theology or a similar discipline at the college level requires at least a master's degree. If this is something you're interested in, then getting a bachelor's degree is the next step. Religious Studies: Religious studies is devoted to investigating and comparing religious beliefs, traditions, history, and institutions. It combines perspectives from a variety of different disciplines such as anthropology, sociology, history, and philosophy to examine religious behavior objectively and contextually, without being partial to any religious tradition. Social Work: Social work programs combine social science research and methodology in order to develop programs that help solve social problems. Many social work programs include coursework in other departments like sociology, psychology, economics, and law. Social work encompasses philanthropic efforts without any religious affiliation. Philosophy: Philosophy is the investigation of intellectual and social questions concerning existence, reason, knowledge, language, body, and mind. It emphasizes and fosters skills such as critical thinking, rational argument development, and persuasive writing. Coursework may cover topics such as the texts of ancient and contemporary philosophers, logical argument and persuasion, and philosophical paradigms. Philosophers are often university professors, but students with an undergraduate degree in philosophy can be found in various professions, such as law, journalism, and politics. Theology: Theology bachelor's programs offer individuals with an associate degree in theology a chance to gain further expertise in the subject. This commonly leads to a teaching career. Professional theology organizations are dedicated to promoting engagement in theology and other related fields. Through professional organizations, students meet other professionals in the discipline, participate in theology conferences, receive notifications about theology-related job openings, and discover publication opportunities in theology journals. Conferences hosted by professional organizations are a great outlet to present theological research and learn about pedagogy practices. The Association of Practical Theology is dedicated to fostering theology education and bridging theological theory with practice. They host their own conference once every two years and a joint session with the American Academy of Religion every year. The AIS is a professional organization that promotes the critical examination of religious beliefs and the influence of religion in society through the development of scholarship and research in religious studies. They host an annual meeting, publish their own journal, and provide employment listings to members. The SSSR is an organization that promotes research about religious beliefs and experiences. The organization facilitates interdisciplinary scholarship on religious topics, welcoming scholars from sociology, psychology, theology, religious studies, gender studies, and other fields. The SSSR hosts an annual meeting and publishes a journal, the Journal for the Scientific Study of Religion, which is one of the most cited publications in the field. Many students pursuing an online associate degree in theology are eligible for financial aid. Check with your school to verify if they offer any financial aid programs or scholarships to students in your field. Some schools offer theology specific, merit- or need-based fellowships. Every student should fill out the Free Application for Federal Student Aid. This allows you to see how much federal aid you're eligible to receive.